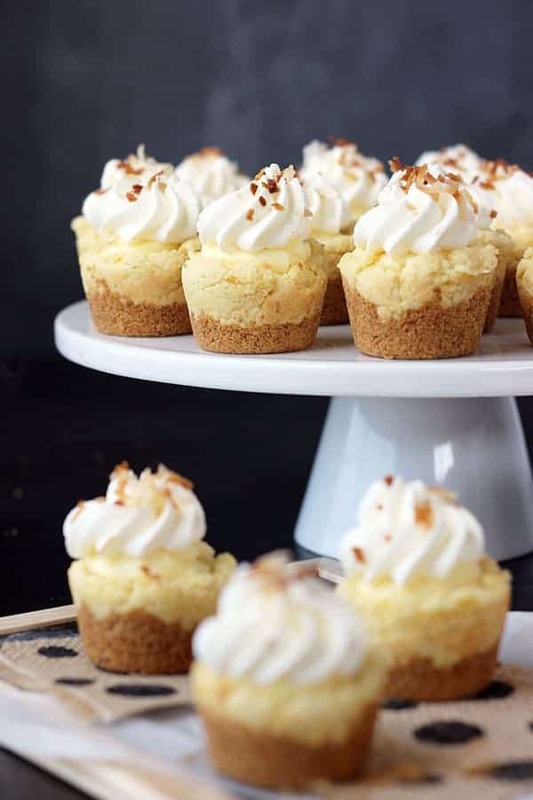 These Coconut Cream Pie Cookie Cups are just like your favorite Coconut Cream Pie but in a cookie form! 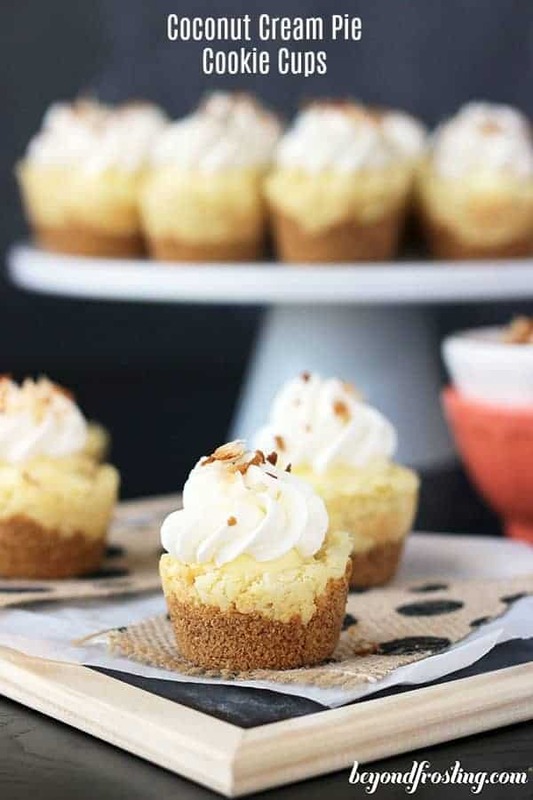 A graham cracker crust with a coconut cookie, coconut pudding filling and whipped cream on top. You won’t be able to stop at just on. I know I have bee all about the no-bake recipes lately, but I decided it was time to turn on the oven to make these cookies. Let me tell you, it is totally worth it. I make a lot of recipes with Cool Whip, but I know that everyone isn’t a huge fan. So I decided that I would try making this recipe without Cool Whip, and instead, I made my own whipped cream. What a difference it makes! These Coconut Cream Pie Cookies are crazy addicting. I can’t say that I have had many coconut cream pies in my life, but I have decided that I have to try it ASAP, this might be a new addiction. These cookies have a buttery graham cracker crust and a coconut pudding cookie filled with a coconut mousse and topped with fresh whipped cream. Plus, there is a little bonus toasted coconut on top. 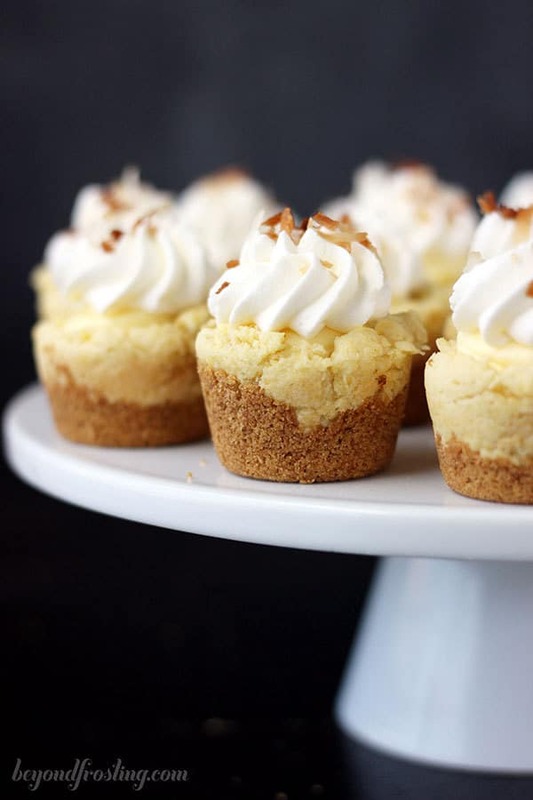 Since I originally wrote this recipe, I’ve become quite obsessed with cookie cups. I read through a ton of different recipes to find out what makes a coconut cream pie what it is. There are so many variations out there that I can’t say I know. So I decided to take a shot at it and see what I could come up with. Let’s talk about the cookies first. These are pudding cookies are pretty much the most awesome cookies on the face of the earth. The flavor usually comes from the pudding mix which also helps to keep the cookies super soft. For this recipe, the cookies are baked into the graham cracker crust. This cookie calls for instant coconut cream pudding. I have only ever seen this at Walmart. So if you can’t find it, I would use vanilla pudding, and double the amount of coconut extract. And because I love coconut, I added some shredded coconut to the cookie dough just for fun. The next layer is the coconut mouse. This is OH MY GAWD delicious. To say that I licked the bowl clean would be an under statement. The mousse starts with pudding. I used a package of instant vanilla pudding mix and reduced the milk that was called out for on the package. I also added a touch of coconut extract. Once this is set (firm) you mix it with your homemade whipped cream and it creates a nice, thick mousse. I mentioned above that I made homemade whipped cream. It’s seriously SO easy, and I do prefer the taste to Cool Whip. I have nothing against Cool Whip and it is my go-to, but sometime I am just craving fresh Whipped Cream. I know not everyone is inclined to make homemade whipped cream, you so can substitute Cool Whip if you prefer. This recipe calls for a double batch of whipped cream since half of it is mixed into the mousse. The other half is to pipe on top of the cookies. So if you choose to use Cool Whip, you should plan to purchase 2 containers. The only thing about these cookies is that they have to be kept refrigerated after you add the mousse and whipped cream. The cookies have to be completely cooled before you add the mousse. I think that the cookies dry out if kept in the refrigerator too long, so I prefer to add the mousse as close to the time that I am serving them. This cookie is absolute worth turning on the oven for! If nothing else, make yourself a big bowl of coconut mousse. A buttery coconut cookie on a graham cracker crust. 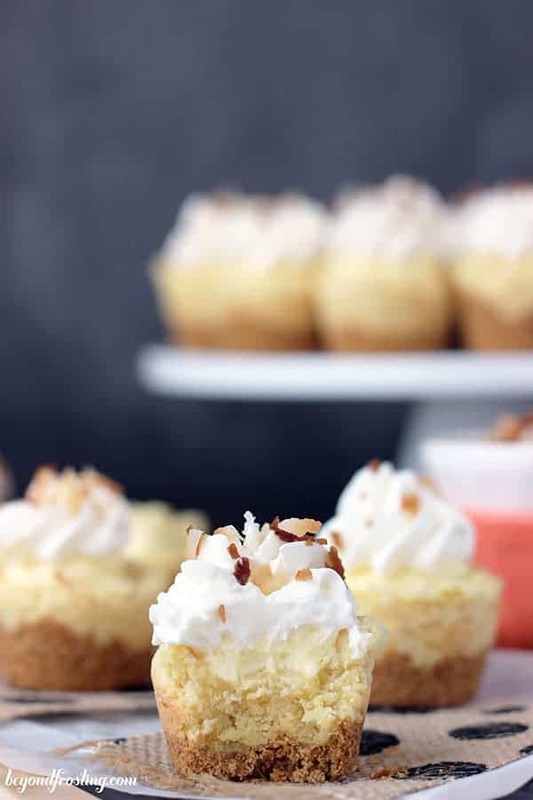 Filled with coconut mousse and topped with whipped cream and toasted coconut. Use a food processor to grind graham crackers into a fine crumb. Melt butter in a microwave-safe bowl until melted. Combine melted butter with graham cracker crumbs and stir until there are no dry crumbs lefts. Spoon 1 tablespoon of graham crackers into the bottom of the mini muffin pan. Press down with a spoon or tart shaper. Allow butter to come to room temperature for about 30 minutes. Combine butter and sugar in your stand mixer and beat on medium speed until light and fluffy. Add egg and coconut extract. Beat into butter and sugar until thoroughly mixed. In a medium sized bowl, combine flour, dry pudding mix, baking powder and salt. Stir to combine. Set aside. Slowly add dry ingredients into batter, and shredded coconut and beat on a low speed until dough starts to form. If dough is a little dry, add 1 tablespoon of milk. Set dough aside. Drop 1-1.5 tablespoons of dough into the greased mini muffin pan on top of the graham crackers. Bake at 350°F for 12-14 minutes. Toast coconut while the cookies are baking. Use a baking sheet lined with parchment paper or a baking mat. Toast until coconut starts to turn light brown. Combine instant vanilla pudding mix with milk and coconut extract. Whisk until powder dissolves. Refrigerate until pudding is firm. Take 1 cup of the whipped cream and fold into pudding until mixed. Do not mix vigorously as it will deflate the whipped cream. Refrigerate until you are ready to assemble cookies. To assemble the cookies, put coconut mouse in a Ziploc bag. Cut the tip off the end of the bag and gently fill the middle of the cookie cup with coconut mousse. 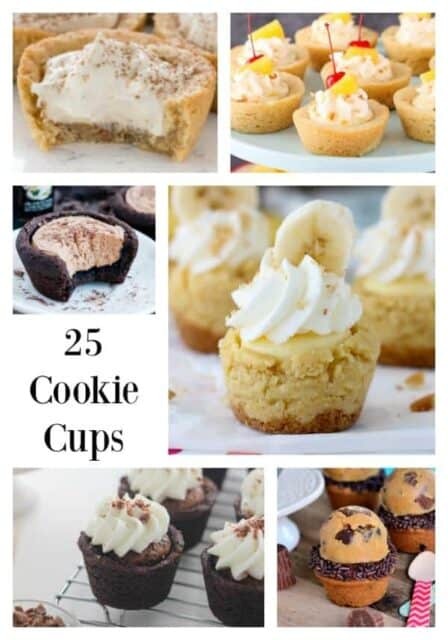 Divide between cookie cups. Top mousse with a dollop of the leftover whipped cream and sprinkle toasted coconut on top. Cookies must be refrigerated in an air tight container after the mousse has been added. Cookies must be refrigerated after mousse is added. If you can’t find coconut cream pie cookies. I would use vanilla pudding, and double the amount of coconut extract. And because I love coconut, I would maybe add some shredded coconut to the cookie dough. My preferred mini muffin pan is from Calphalon. It is deeper than a traditional mini muffin pan, allowing you to create slightly larger cookie cups. Hi Cathy- do you mean silicone baking cups? Can these be made the night before serving? 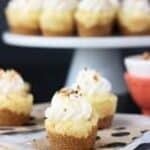 Would I just add whipped cream day of, or would I need to add cornstarch to help it hold up? Hi Kasie, yes absolutely! 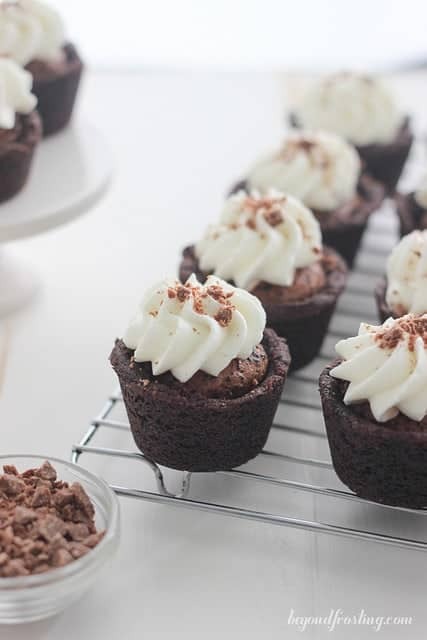 The powdered sugar in the whipped cream is enough to stabilize it over night, but I find that it works best to pipe the cookie cups and then refrigerate, instead of preparing the whipped cream the night before and piping the next day. Hey there! I am making these delicious looking lovelies for an hors d’oeuvres party this Friday. In your writing you say to spoon out 6T of the vanilla pudding for the mousse but on the ingredients you list a whole package. I want to make sure I put in the correct amount! Hi Kelly! Sounds yummy! I revised the original recipe to call for 1 package of pudding but I reduced the amount of milk. You will have leftover mousse, but it’s so good I am sure you’ll find an excuse to eat it up! I am baking these right now and I took them out at like 13 minutes and was letting them cool and when it came time to push the centers down they weren’t completely cooked. Idk if I added too much cookie but the middles just won’t cook. I added about a tablespoon. So now they are back in the oven but I’m worried they will dry out if I bake them too much longer. Not 100% happy with the recipe. I hope this is still monitored….BUt i was wondering if i use a 12 cup cupcake tin would i bake the same amount of time? Ni Nicole, yes, but I would check about 2 minutes before the end time just to be sure. Every pan and oven are different. My pan is a deep dish, so your baking time might need to be adjusted. Loved your recipe and want to try it but in my country “pudding mix” is nowhere to be found, is there any substitute? Hi Elisa, Can you make a homemade vanilla pudding? 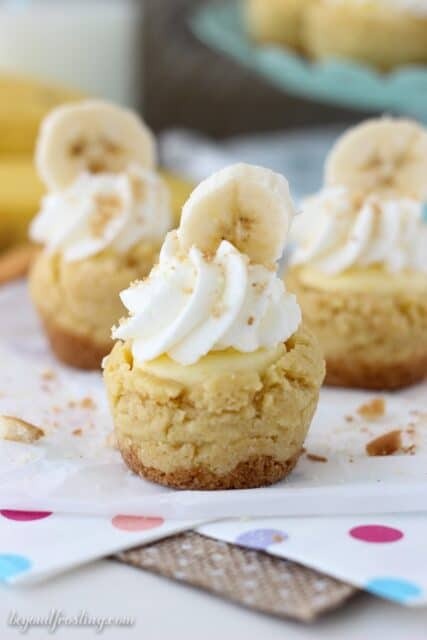 Found a recipe with these ingredients: 1 cup granulated sugar, ¾ cup cornstarch, ¾ cup nonfat dry milk powder, 1 teaspoon kosher salt, 2 whole vanilla beans. Hope it works!! Thanks a lot. Hi Rhonda! You should add it to the cookie dough. Thank you for calling my attention to this. The recipe has been updated. I hope you enjoy and please come back and let me know how they turned out! Hi Stephanie, I always used sweetened.